Above is a picture I flagrantly stole from Forgotten Buffalo, the folks who run those tours I go on to Black Rock and Lackawanna. It is of Battenfeld Oils and Greases! That is a place I love passing on the 190. I love that heavy old German name, Battenfeld. Perhaps one of the German scientists who put Body Worlds together was named Battenfeld! You never know! Then that hard-core industrial "Oils and Greases." And as Forgotten Buffalo was explaining the building used to be a brewery. They said you could tell that right off which, I confess, I could not. But then they could not be able to listen to a Chopin sonata and tell immediately it was Leonard Pennario. So, I do not feel too bad! 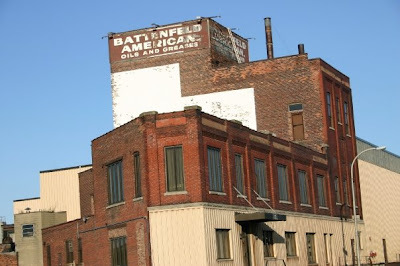 Battenfeld used to be the F.X. Kaltenbach Brewery and later it was the Buffalo Brewery, owned by Mayor F.X. Schwab. I love how they both had those F.X. initials. Francis Xavier. Or perhaps Franz Xaver, in the case of Kaltenbach. It is funny how whenever you see F.X. you know that person was named for St. Francis Xavier. That is the only thing it stands for! Like my priest friend from St. Gerard's, F.X. Mazur. We call him Butch but his name is really Francis Xavier. 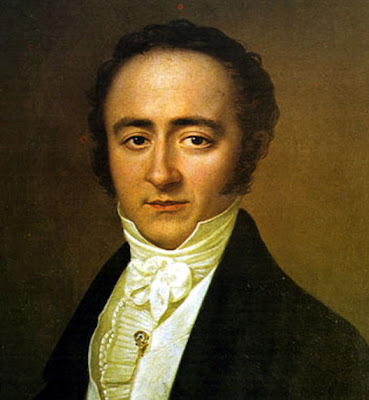 Mozart named his son Franz Xavier. That was in honor of Mozart's good friend and student Franz Xaver Sussmayr. Later the kid changed his name to Wolfgang Amadeus Jr. That F.X. was not good enough for him! Here is a picture of F.X. Mozart. There are not as many F.X. 's running around now as there once were. People are naming their sons Tyler and Zachary and not that. But still. Howard and I were talking about how in some ways in Buffalo, in ways we do not immediately grasp, our immigrant roots still dictate how we live! We are a city of beer drinkers. Many of our ancestors were -- the Germans, the Irish, the Polish. And we are, too. We are also coffee drinkers as opposed to tea. The British people who were among the first here were outnumbered by all the waves of immigrants. If you go to liquor stores as I am known to do now and then notice all the people who are buying Blue Nun. That sweet-ish German wine, that hangs on! On Friday people whose families were never Catholic tend to crave fish. That is still the special in a lot of the restaurants. Even though the Catholic Church relaxed that no-meat-on-Fridays rule for most of the year, the tradition hangs on. You expect to see fish fries on Fridays. You expect clam chowder. What else? Wasn't that an old Polish tradition to close places on Wednesdays? Sometimes you still see that. On Hertel Avenue most places are still closed on Sundays. Elmwood is more modern and everything will be open but on Hertel you can go for blocks and most places are shut. It is like Europe. I credit the Italians for that. I will think of that tomorrow when I am stacking cheese sticks in the Sorrento Cheese Italian Heritage Festival Cheese Building Competition. Certain immigrant traditions will be disappearing. The German identity is not as strong as it was, and no we are more health-oriented, so fried bologna and Fastnachts are going to turn into a thing of the past. I do not eat them myself even though my family is German. My mom does but I do not. Still I will be sorry to see them go. Here is something funny. The Germans and the Irish married each other a lot and whenever that happens, the German part disappears. I am just saying. Everyone knows someone who is half German and half Irish and I guarantee, that person will go around carrying on about being Irish, ignoring that inconvenient other half. Probably it is because of the negative German stereotypes. But it could also be because it is easier to honor your Irish heritage because Irish pubs are everywhere and you can go to Ireland and speak the language. Plus the only classical composer you really have to worry about is John Field. So there is something to chew on with your fried bologna. Now I am kind of craving it. It all started with Battenfeld Oils and Greases! The power of suggestion is an awesome thing for I am going to go fry some bologna for breakfast. It has been far too long! Thanks for the John Field Nocturne and info. Excuse me, but my ethnic background is German and Irish. The classical music influence stresses the German, but that can't be helped. The German side of me wants to conquer the world, but the Irish side is too drunk to bother doing it - that's how I perceive it. Actually, I'm allergic to ethnic pride...just another barrier between people. It is extremely sad to see all these old traditions just fading into the past, most to never be remembered. Here's something I've noticed. Now that everything is open on Sunday, Monday is almost always the default day to close. Try going to a small business or restaurant on Monday. It's almost impossible! Buffalo can be like a ghost town on Mondays.